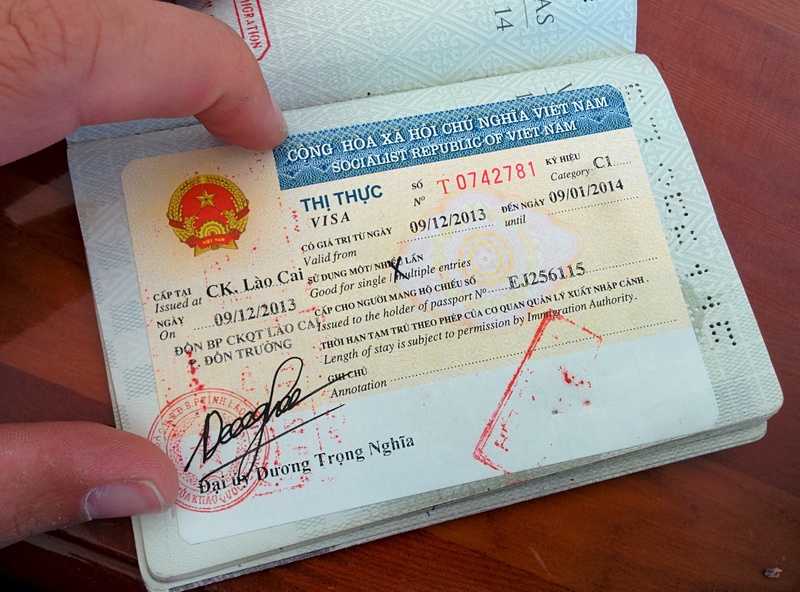 Provided you are eligible for a Vietnamese visa, you can get a same-day Vietnamese visa at Hekou 河口, the Chinese border crossing with Vietnam’s Lào Cai 老街 (allowing access Hanoi by train or to Sapa by bus). It is easy and quick, although possibly not entirely legal. Below is how you do it, why to do it and what the risks are. Choose a working day (bear Vietnamese public holidays in mind) and a time shortly before 4 pm for the shortest wait. Bring your passport and some cash (this may vary from nationality to nationality, but for most Europeans it’s 500 RMB or less) to one of the many travel agencies at Hekou. I picked an agency diagonally opposite from the friendship bridge, which had 办签证 (process visa) over the door. It’s pretty much next-door to the juice bar on the corner. You don’t have to fill in any forms, or supply photographs. Just pay and give them your passport. Agree on a place and time to deliver your visa (usually between 6:00 – 6:30 pm). Be sure to grab their phone number in case something goes wrong. Meet them at the agreed time and place, take your passport and cross. The border is open until 10 pm. Timing. Your visa time starts ticking from the day you intend to enter. You are allowed to enter later but not before. If you do enter later, you have to subtract this time from your total visa time. For instance, if you apply for a 30-day visa at the Kunming consulate with the intention of going to Vietnam on 15 March, but you enter on the 20th, you will only be permitted to stay until 15 April, not 20 April as would be the case with many places. If you’re an independent traveller and you’re not exactly sure when you will arrive at the border, this can cost you valuable visa time, or extra nights in Hekou. Speed. When you apply at a consulate or embassy, the standard processing time is 3 working days. You can get a same-day service but this will cost you more. Application time is generally from 8:30 am to 11:00 am and pick-up time at 6:00 pm which means that even with same-day service, you’re waiting at least 7 hours. In Hekou, you can get your visa in as little as 2.5 hours. Also, no queuing. Money. Yes, you can even save money if you’re getting your visa at Hekou. At a consulate, the 3-day processing fee is 390 RMB. The Hekou version is more expensive: 500 RMB (but the gooey girls at the agency were flirting with me so I paid 450 – this means you can bargain! ), BUT you’re getting same-day service. If you want same-day service at a consulate, you will pay 540 RMB. Also, Hekou is so small that you can walk to the agency, whereas in Kunming you’ll have include a 2 round-trips by bus or taxi (2 rides for applying and 2 for picking up). Hassle. At a consulate they will ask you to fill out massive forms and bring photos, and in rare cases even require that you book a hotel. The officials at the Kunming embassy are downright impolite so dealing with gooey girls at a Hekou agency is a lot more pleasant. At Hekou, you don’t need anything. No documents, no photographs, no hotel bookings … Just your passport and the cash. Generally speaking, visa are only available from official entities such as consulates and embassies, or departments of immigration. However, there are plenty of countries that allow travel agencies to take care of business for you. In Vietnam, you can get extensions for your existing Vietnamese visa almost anywhere. They are then sent off to Ho Chi Minh City (Saigon), where they are processed and sent back. This is not the case when you apply at Hekou, as the passport is provided with a visa at Lao Cai, where foreigners cannot normally get a visa. The agency staff walks into Vietnam with your passport (Chinese nationals are allowed into Lao Cai for up to 7 days without a visa), slip a bribe to an official on the Vietnamese side who slaps a visa on in your passport. Then they walk back. Of course, this smells a bit. Corrupt officials who were illegally providing visas and have been caught will of course lose their job, but normally it doesn’t affect people that have enjoyed his or her services. However, there have been isolated incidents of countries that revoke the visas issued by this official and even do not allow bearers of such visas to return to the country. That is a possibility I cannot rule out, but it’s a risk worth taking. thank you for this interesting article. Do you know if this is still possible? We are in China right now and would like to get the Visa in Hekou. Hi Lisa, I’m not sure if it is. If you try, let me know how it panned out!